Well, we can't say that they didn't warn us. 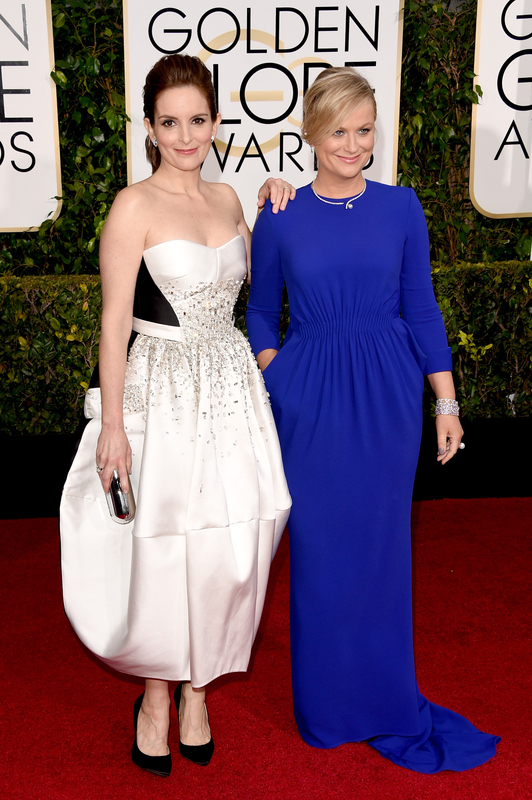 Whether you found Tina Fey and Amy Poehler's opening monologue at the 2015 Golden Globes absolutely hilarious, or pretty lackluster at points, there was one part that had just about everyone cringing, both at the ceremony and here at home. As they promised, Fey and Poehler incorporated Bill Cosby and the sexual allegations he has been facing in recent months into their comedy routine — and it was just as shocking and awkward as you might expect it to be. "In Into the Woods, Cinderella runs from her prince, Rapunzel is thrown from a tower for her prince, and Sleeping Beauty just thought she was getting coffee from Bill Cosby," Poehler said bluntly — and by bluntly, I mean, that sentence started at point A and ended at point ouch. But it wasn't over yet, folks. Fey was next to get the comedy ball rolling, continuing in the face of the cringe-gasp-laughter combination reaction from the audience with, "I don't know if you guys saw this on the news today, but Bill Cosby has finally spoken out about the allegations against him. Cosby admitted to a reporter, 'I put the pills in the people. The people did not want the pills in them.'" Of course, there is sure to be a debate as to whether or not it was appropriate for Fey and Poehler to poke fun at so serious a news story, but it's worth noting that the way they poked fun at it was actually rather classy. They kept the focus of the joke on Cosby himself, did not debase or mock the alleged victims (unless you count Sleeping Beauty as a victim), and spent more time arguing over which one of them was doing a better Cosby impression than they did making pointed remarks about the situation. Overall, it might have made more than a few people uncomfortable, but it was the most appropriate way to make such an inappropriate joke. However, I think Jessica Chastain's face said it all when it comes to the best summary of how everyone reacted to this entire bit. Chastain covered half her face with one hand and said, "Wow," looking as if she wasn't sure if she should be laughing or if she should be trying to find the nearest exit to get away from them. And I was right there with her, my jaw on the floor. Oh no they didn't! But, yes, yes they definitely did. Whether it was a good way or a bad way for them to handle their final Golden Globes hosting gig is for the Internet to decide.